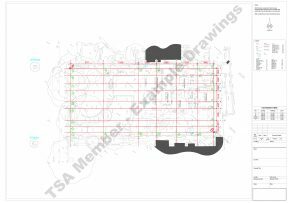 This is a typical verification/proving survey of grid lines together with key engineering setting out points for a proposed development. Commensurate to 1:100m plotting accuracies. This is a typical verification/proving engineering survey of the proposed building corners and centre-lines of the ‘dig’. There are also a number of co-ordinated keys points in and around the site which were also checked. Commensurate to 1:100m plotting accuracies. 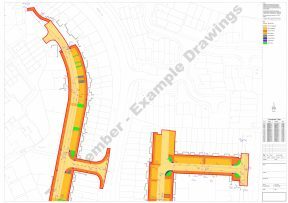 This is a fairly standard engineering survey plan of an area of road with associated drainage details for local council adoption. This will not normally include private land unless there is an easement of the route to another adopted MH or service. The colours and details shown are usually specified by the local council then under the direction from the developer. 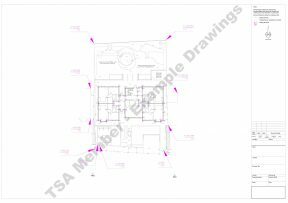 This particular plan has the building positions checked with the underlay OS data supplied by the developer or local council. Commensurate to 1:100m plotting accuracies. 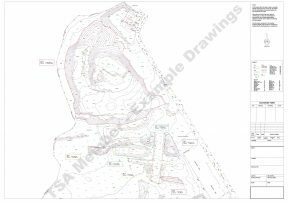 This is an engineering/topographic survey of the to define the Spoil Heaps for Volume calculations. Other parts of the site were surveyed to confirm levels and boundaries. This was part of a multi sheet survey. Commensurate to 1:200m plotting accuracies. 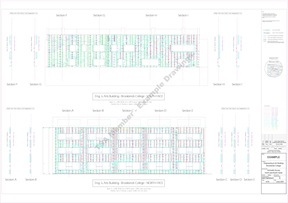 This is an engineering verticality contour survey of newly constructed building to analyse the sun’s reflections that were extremely disruptive to surrounding existing buildings at this college campus. This was part of a multi sheet survey. Commensurate to 1:100m plotting accuracies.